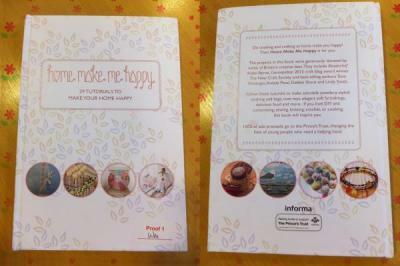 Home Make Me Happy was born from a corporate social responsibility initiative undertaken by Informa plc's Manchester office as part of The Prince's Trust Million Makers programme, which challenges businesses up and down the country to raise £10,000 each for the charity. We wanted to produce a multi-craft book that champions individuality while maintaining the strong sense of community that is present in everything that The Prince’s Trust does. That’s why we decided to source individual ideas from bloggers, small businesses, and craft enthusiast in order to share the joy of all those ideas for homemade goodies. What’s it all in aid of? Every penny raised by Home Make Me Happy will go straight to The Prince’s Trust (www.princes-trust.org.uk), a fantastic charity that inspires and helps change young lives. Home Make Me Happy aims to fundraise for this more than worthy cause through a project that will showcase the talent of the crafting community and inspire people to get creative. We've had fantastic support from our talented authors and book designer Benn Linfield, and www.printondemand-worldwide.com have generously provided our print run free of charge.